FC Porto and Málaga offered a much awaited Iberian duel between two of the most entertaining teams to see which team would progress to the Champions League's next round. With James Rodríguez only fit for the bench, FC Porto coach Vítor Pereira stuck with Izmailov deputising for the Colombian star and Varela got his starting place back after Atsu played against Beira-Mar. Málaga coach Manuel Pellegrini, in turn, chose to play Roque Santa Cruz up front, with Joaquín in his usual position out wide and Isco on the left. In the middle, Toulalan and former União de Leiria midifelder Iturra fought an unfair battle against the home team's central trio of Fernando, Lucho Gonzáles and João Moutinho. Pereira's men came out pressing out of the gate, trying to stifle the opposition and convey a message of dominance. 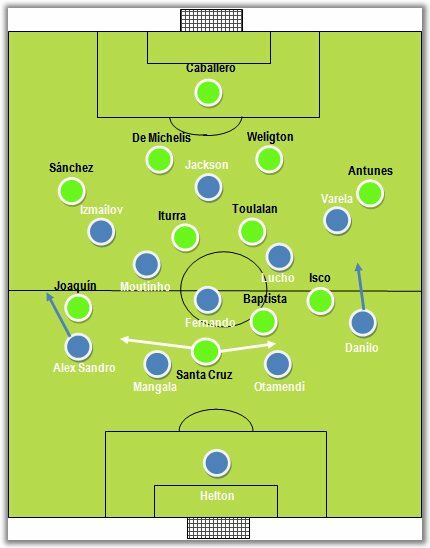 Moutinho or Lucho would be the first man to lead the pressing as soon as Willy Caballero put the ball in the centre-backs' feet, since all four of Málaga's back line looked uncomfortable on the ball. Oddly enough, Pellegrini favoured Júlio Baptista over a third player in midfield, which would eventually prove costly. With Isco nominally on the left (even though he would never hug the touch line), much of Málaga's threat was diminished, with the Argentinean coach seemingly putting his faith in a more direct approach. Because Isco was deployed on the left, he was supposed to pick up Danilo's runs - something he did not seem too willing to do and that opened huge pockets of space both for Danilo and Lucho as well. With Izmailov frequently acting as a fourth midfielder (just starting a bit wider), Toulalan and Iturra often found themselves overwhelmed in the middle, with too much ground to cover. 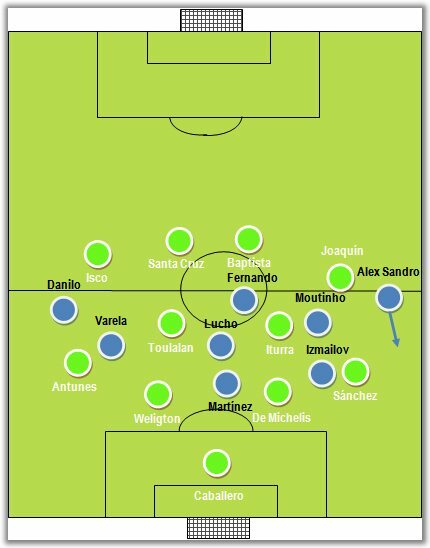 Indeed, unlike most 4x2x3x1 and 4x4x2, Málaga were surprisingly different while defending, choosing not to form two banks of four, allowing Moutinho and Lucho to roam free and dictating the match's flow and tempo. FC Porto would start their moves on one of the flanks, quickly move the ball into the centre and swiftly displace it towards the other wing, where numerous 2v1 situations kept being created. FC Porto found large holes in the middle against Toulalan and Iturre. However, despite all the space the Portuguese champions benefited from, they were not able to convert it into clear-cut chances, missing a creative spark or a bit more aggressiveness on the wings. Danilo, in particular, regressed in his ways and did not offer any threat out wide, tapering FC Porto's play toward the centre even further. As the match wore on, Málaga started looking like undoing themselves, becoming ever more disjointed, especially in transitions into defence, Toulalan and Iturra still trying to cover as much of the pitch as possible, with little help from Málaga's forwards (when asked about it in the press conference, Pellegrini would deny that lack of protection was decisive). The second half did not seem to offer any news, with Málaga apparently content with the result and not willing to commit too many men forward and become exposed - ironically so, since their forwards contributed very little while attacking and even less while defending. James Rodríguez started warming up and as he was summoned to go on the pitch, João Moutinho scored the match's only goal from Alex Sandro's accurate assist. It was basically the first time a FC Porto midfielder had tried to make a run into the box and confuse their opponents' marking duties. The Dragons were quicker and more precise throughout the ten minutes that followed the goal, but the simultaneous presence of James Rodríguez and Izmailov annihilated FC Porto's presence out wide. The home team would look more dangerous after Atsu took the place of the Russian winger, stretching the play and making Sérgio Sánchez and De Michelis pay for their sluggishness. All in all, the Spaniards managed to fend off most of FC Porto's attempts to break them down the middle, but were virtually non-existent in attack. If they are to mount a serious challenge for a place in the next round, they will have to up their game quite a bit. The question remains, though: Will FC Porto resort to a more cautious approach and let Málaga dominate (thus opening space at the back) or will they insist on stifling their rivals' potential threat?